Independent Sen. Bernie Sanders of Vermont promised to "do whatever is necessary" to stop President Obama's tentative tax cut deal with Republicans, and today he showed how far he is willing to go. 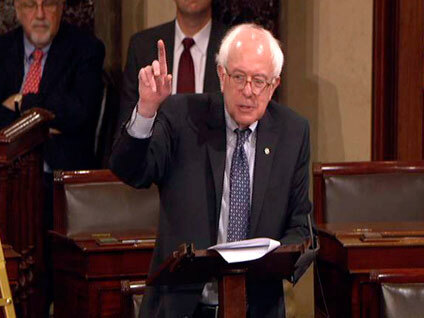 Sanders, a self-described socialist who caucuses with the Democrats in the Senate, has been speaking on the Senate floor since around 10:30 a.m. this morning, staging a symbolic filibuster against Mr. Obama's deal with Republicans, which would temporarily extend the Bush tax cuts for everyone, including the wealthiest Americans. He has yet to take a break, although he shared the podium for a bit with Democratic Sens. Mary Landrieu (La.) and Sherrod Brown (Ohio). Sanders intends to keep talking for "as long as he can," a spokesperson for the senator told the Huffington Post. Sanders' efforts don't amount to a true filibuster, since he is not holding up any Senate debate, and there are no other senators wishing to speak. The Senate isn't scheduled to take up Mr. Obama's plan for a vote until Monday. "You can call what i am doing today whatever you want, you it call it a filibuster, you can call it a very long speech..." Sanders posted on Twitter today. Sanders' efforts became something of an Internet sensation Friday; "Bernie Sanders" was a trending term on Twitter (folks followed the filibuster with the hash tag #filibernie), and streaming video of his speech reportedly temporarily shut down the Senate video server. The senator called out his Republican colleagues for their "hypocrisy" in wanting to extend tax cuts for the wealthy while complaining about the deficit. He also railed against the growing income disparity in the United States. In 2007, the wealthiest 1 percent of Americans earned more than 23 percent of U.S. income -- more than the entire bottom 50 percent of the country. Since then, some Democrats have complained in the wake of this tax cut plan, the disparity has only gotten worse. Sanders read several letters on the floor from his constituents who wrote to relate their stories of hardship, particularly their struggles to pay heating bills in the winter. "This is the United States of America... people are going cold," Sanders said. "And my firends here are talking about tax breaks for billionaires? What are we talking about? What kind of priorities are those?" He continued, yelling passionately, "We should embarrassed that we are for one second talking about a proposal that gives tax breaks to billionaires while we are ignoring the needs of working families, low income people and the middle class." Wealthy Americans would benefit the most from Mr. Obama's tax cut package, and some of the proposals included would actually make taxes increase slightly from this month to the next for poor Americans. On CBSNews.com's "Washington Unplugged" yesterday, Sanders called the president's deal "totally absurd" and called on Mr. Obama to sit down with Democrats to "negotiate a stronger bill." He warned that if the plan is approved, "Two years from now they're going to be extended again and again and maybe even made permanent." Along with extending the tax cuts for two years, the agreement includes a commitment to extend unemployment insurance, temporarily cut the payroll tax, and set the estate tax at a relatively low level, among other things. The package deal is expected to cost around $900 billion and is not paid for. When the Senate begins voting on the tax cut deal on Monday, they will need to get 60 votes to overcome any filibusters from Sanders or others opposed to the plan. The Los Angeles Times reports that the last time a senator staged a true "filibuster" was in 1992, when then-Sen. Al D'Amato (R-N.Y.) spoke for over 15 hours on the floor against a tax bill. The record for the longest filibuster belongs to the late Sen. Strom Thurmond (R-S.C.), who spoke for over 24 hours to block a landmark civil rights bill. These days, senators simply declare they are "filibustering" and continue with Senate business.